Layers over layers of very finely shaven ice so much so that it doesn't even taste like ice. It was some miracle ice-shaving machinge that is involved in this! But the thread-like ice "fluff" were so delicious. 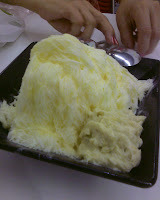 We ordered a corn-flavoured base and a dollop of D24 durian puree on it. Bliss... Amazing how different the texture of shaven ice can be! Our Cammeray apartment has been packed up in 3 hours by the movers. The things that we are shipping over to Singapore will apparently arrive in 3 months' time. In fact if they take 5 months to arrive, we would be even happier as it means no storage and our stuff would still be in transit and hence, insured. Fingers and toes crossed that my retro glassware and ceramics arrive safely. Particularly I am praying for my 2-tier glass cake stand, the little ceramic Kiwi cake stand, my Steve Sheridan bowl, those hollow-stemmed champagne glasses and my English tea cups. I hope to see them safe and sound for the afternoon teas I am planning to have in the second half of the year. Singapore is growing as a City of the Arts. I was surprised to find a section of the Berlin Wall with the mural by a graffiti artist called "Kings of Freedom" in the Bedok Reservoir. I think that was my first time in the Bedok Reservoir despite living in the east and I've been to the MacRitchie reservoir and the Lower (or is it Upper) Pierce reservoir which are far, far away from the east. I thought the significance of the duo very interesting. The King on the right is blindfolded, blind to the sufferings of his people. I forget about the King of Freedom on the left. As a City for Foodies, Singapore is a good place to be. Prices are very reasonable, ther e is lots of varieties but the standards vary too. 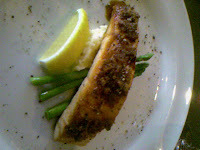 I had a 3-course set meal at Friends@Jelita and the salmon mains was the star of the meal. It was nicely seared, I liked the caramelised shredded coconut on the top although I found it a tad sweet, even with my sweet tooth. It could do with more asparagus and mash potato too. The grilled squid on squash appetiser was average while the choc truffle cake was below par. It had a musty chocolate smell, like old chocolate and I only ate 1 of the 2 tiny cubes they served up. Art and food are my twin passions. I think I will be spoilt for choice here. This Valentine's Day, G is still in Sydney, spending his last few days there, tying up loose ends and saying good bye to all his friends, while I am in Singapore, stuffing my face full of pineapple tarts and other CNY goodies. VD is not really a big thing here this year as it is over-shadowed by CNY. So on VD which happens to be day 1 of the CNY and most restaurants are closed for business, I ended up at Waraku, a Japanese restaurant with my youngest sister and her husband. 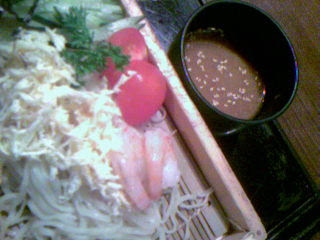 I had a cold soba noodle, with a delicious sesame dipping sauce. It was light and refreshing after all the CNY goodies I have stuffed myself with. Definitely going on the healthy-eating regime when G arrives - whether by choice or not! Chinese New Year is a time for eating lots of yummy and fattening goodies. It is also a time to traditionally buy a few new outfits (or 5) to kickstart the new Lunar year with everything new - clothes, shoes and even underwear for some. I haven't bought any new CNY clothes over the last 4 years while I have been in Sydney. And so this year seems particularly special in terms of getting some pretty new clothes, dresses to be exact as I've decided that the easiest way of dressing for work was to throw on a dress. No need to worry about matching tops and bottoms. 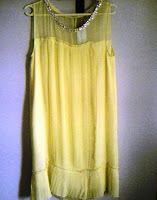 Even better if the dress was in a fabric that does not require ironing. Over the last 3 weeks, I had bought 2 dresses in different shades of purple/plum. That colour was everywhere. I was getting a little concerned that my only 2 new purchases were so similar no one was able to tell the difference! Then yesterday whilst waiting for my sister to leave the office for dinner, I decided to have a wander around a few dress shops I knew nearby to see if I could find anything nice. The first shop stocked cloth es from Korea and was run by a Korean lady. The dress she recommended was a popular buy according to her, it was in a nice cotton fabric and simple and in a classic retro Audrey Hepburn style which I quite liked. But the colour was a little staid, a navy blue with a ochre lining around the neckline. So I KIV-ed that dress and decided to widen the search. The next stop was staffed by a very good sales lady. She proceeded to bring out one dress after another for me to try when I've identified a couple that I might like. After trying on 7 or 8 dresses, I decided that my top 2 favourites were a Chanel-esque flapper-style dress in yellow and a black and white Eley Kishimoto dress. I can always go back for the blue and brown Stepford wives dress which is slightly tight around the underarm and needs to be taken out half an inch and the deep emerald green dress with the interesting sleeves. But for now, I bought my top 2 choices. And they are not purple! I am all set for the Chinese New Year. After 6 months of being footloose (literally) and fancy-free, with my feet now encased in work shoes, 5 days a week over the last 4 weeks, bunion-looking growths have started sprouting on a couple of my toes. 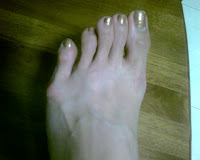 Unfettered toes, unfettered soul. With my toes now firmly imprisoned in these leather heels, I can feel the shackles tightening not just around my toes, but around my soul as well. I need to let the toes loose more often. 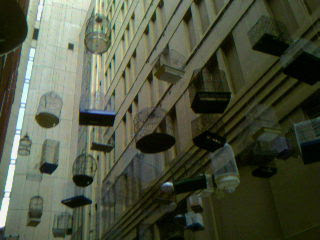 We chanced upon this public art installation while waiting for the doors of the Angel Place Recital Hall to open. It was dusk, but there was a burst of twittering in the air. Most unusual. So we followed our ears round the corner into the alley. This sight greeted us. Very cool! 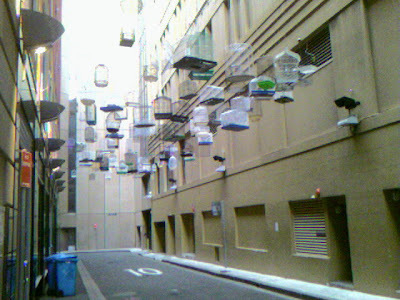 A range of bird cages, of all shapes and sizes were strung up across the alley way. For the birds, you would have to use your imagination and aided by the audio, you can visualise various types of birds in their cages, singing away to their audience below. This was a treat. I don't think many installations reach out successfully to the masses, but I think this one certainly did, in its simplicity and with its use of common day objects and with the aid of sound. I give it two thumbs up! People are normally in a hurry to get from point A to point B, finish their chores, complete their goals. The journey towards the goal is just a means to an end. They have no tine to stand and stare. No time to wonder whether the pretty white/yellow/pink flowers growing amongst the grass, could possibly be a weed, considering how lovely they are, and weeds conjure up an image of bad, choking plants. No time to notice that the little white daisies grow invariably in a ring, such a wonder of Nature. No time to wonder what those guava-looking green fruit growing on wooden fences are, and if they are edible. 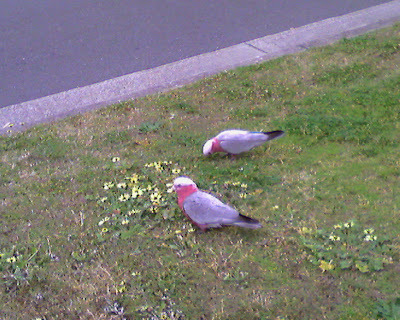 No time to notice these pigeon-looking birds but with a lovely pink collar and bib, hanging out on the grass verge, 2 pairs in all, scouring the grass for seeds, fluttering around when they spy a person coming a little nearer to them to take a better look. Were they pigeons (prettier than normal ones) or were they a type of parrot (G thinks so when he saw my photos). I just think they are so pretty and I have never seen any pigeon or parrot like them.